Charles pledged Sig Ep at N.C. State in the fall of 1954 and was Initiated February 1955. He was chapter president 1957-58. Graduating in 1958, from Army ROTC, he was commissioned into the Army. The best anyone knows, Charles was an Army helicopter pilot and volunteered out of the Army to join up with Air America as a “civilian” copter pilot directed by the CIA. Status: Killed In Action from an incident on 05/30/1961 while performing the duty of Co-pilot. Short Summary: Landing accident caused by loss of control after entering a cloud during approach to Padong. Aircraft: UH-34D tail number H-G. Adventure, intrigue, danger, sacrifice--words that fit Air America well. Air America was a CIA - owned and - operated "air proprietary" during the Cold War against the global menace of communism. From 1946 to 1976, Civil Air Transport (CAT) and Air America served alongside U.S. and allied intelligence agents and military personnel in the Far East, often in dangerous combat and combat support roles. Behind a shroud of strict secrecy, many Air America personnel were unaware that they were "shadow people" in counterinsurgency operations. On March 29, 1961, Clarence J. Abadie led a flight of 16 UH-34s from Bangkok to Air America's new found operating base at Udorn in northeastern Thailand, some 40 miles south of Vientiane. The helicopter force soon became involved in supporting Hmong forces engaged in fierce battle with the Pathet Lao at Padong, a mountain top position south of the PDJ. 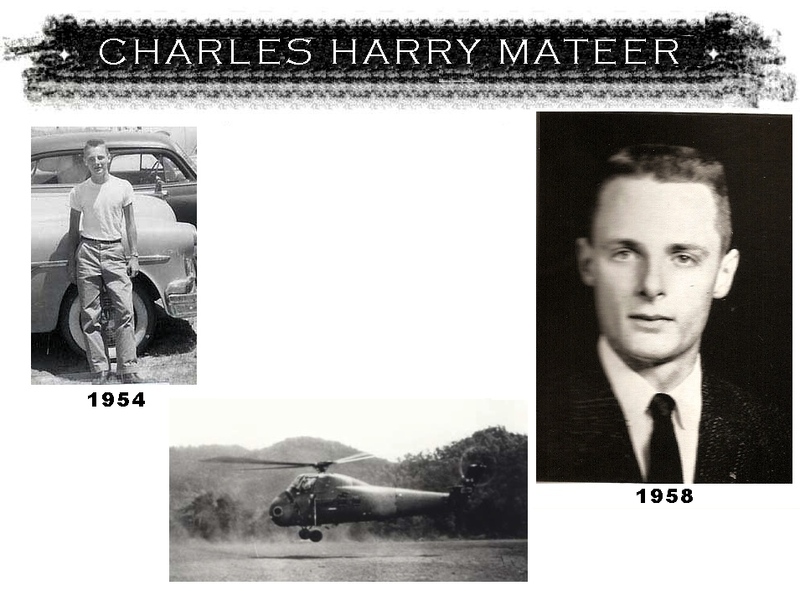 On May 30, the first Air America helicopter pilots died in Laos, when Charles Mateer and Walter Wizbowski crashed in bad weather attempting to land supplies to the besieged Hmong garrison at Padong. Charles Mateer.... We graduated from Charlotte Central in June 1954 and entered NC State in September 1954, rooming together at 207 Owen. Charles and I were freshman engineering students, walking the tracks to class every day, including Saturday. After we had been at State for a couple of months we got a bright idea: Take the Naval ROTC exam so we could get an excused absence from the weekly Saturday morning math test. The ROTC exam was given all over the state on the same day, a Saturday. We signed up for Charlotte. The goal was to leave Raleigh Friday afternoon in time to get to Charlotte for Central's basketball game that night. The plan worked. We got to the game, took the exam the next morning and returned to Raleigh Sunday evening. A few weeks later we were both notified that we had "passed" the exam and we were to show up for a physical at the Raleigh Post Office. Neither of us went. After all, we had accomplished the goal. We were happy at State, making good grades, etc. Had we continued with the NROTC lark, we would be required to transfer from State which had no NROTC. So we stiffed the Navy. A few days after the missed appointment, our dorm counsellor summoned Charles to the phone. When he returned to our room he said it was the Navy, that they asked him if he wanted to reschedule. He said he told them, "No," and they wanted to talk to me. As I walked down the hall I made a fateful decision. If given the opportunity, I was going to say, "Yes." Indeed, the Navy offered. I said, "Yes." I got the scholarship and transferred to Duke, graduating in 1959. On the other hand, Charles continued at State in its Army ROTC, got a commission and became an Army helicopter pilot. He was single, a quiet, unassuming man. He was not a soldier of fortune. It came as a surprise when I learned he had left the Army for a "civilian" job in Southeast Asia. It was with a heavy heart that I learned he had been killed in Laos. An "accident" it was called. Not so as I learned years later. In 1954, according to the Geneva Conference, Laos got the status of an independent state. The Royal Lao Government was the designated governing authority. However, the Pathet Laos (PL’s) whose pro Communist characteristics during the cold war, resulted in their endeavoring to take control of that country as they engaged in gorilla type tactics to over throw the new Laos government. The Ho Chi Min trail, the main Communist supply line, wove its way down through Laos as did the Communists and their supplies while they continued their rampage, to takeover that country. In 1955 the rice crop failed and famine threatened several provinces in Laos. Air America again came to the rescue, this time using 3 C46’s based out of Udorn in Thailand, they air dropped over a 1,000 tons of relief supplies. When the troubles started in Laos in 1959 there was concern for the Hmong tribesmen there, lest they suffer retaliation from the Communists as a result of their association with the French. Vang Pao a Hmong leader, was motivated by General Phoumi of the Royal Lao Army and assisted by the US Special Forces trained and turned the Hmong into a fighting force to be reckoned with. Vang Pao maintained they would fight the Communists or leave the Country while adding that he could raise an army of 10,000 men. These tribesmen were scattered over the mountains in Laos. The CIA realized the necessity of good communications as a result of which Air America entered the Rotary Wing business in earnest and supported the Hmong during their many battles but in particular with the one fought against the Pathet Lao, at Pa Dong. By June 1960, it had become clear that helicopters would form a permanent part of Air America' s operations in Laos. The United States Special Forces had trained 9000 Hmong tribesmen and furnished them with equipment to engage in gorilla tactics. As their numbers grew, so did the Air America Rotary wing fleet and went to become their lifeline. While the men were away fighting Air America kept the villages supplied with food while furnishing supplies and equipment to their fighting men. Charles Mateer and Walter Wizbowski were the first two Air America helicopter pilots killed as they attempted to land supplies to besieged Hmong there in bad weather. “Never in the history of the British Empire has so much been done by so few for so many,” complimented Winston Churchill on the actions of the Royal Air Force during WW2. A total of 243 CAT/Air America personnel gave their lives including those missing or presumed dead, in the course of duty, during Air America's tenure in South East Asia. They may be gone but not forgotten as their names are engraved for all to see, on the role of honor at the CAT/ Air America Memorial on display at the McDermott Library, at the University of Texas in Dallas, Texas. None of these casualties are included on the National Vietnam Memorial in Washington, DC. The “official” explanation is that they were “civilians”. 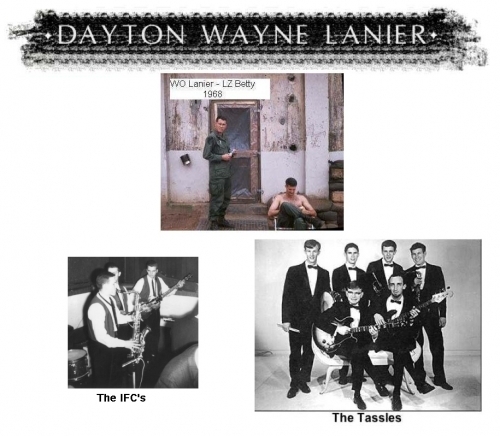 By all appearances, Dayton would have been an ‘old-man’ as compared to the 18 year-olds that were inducted into the Army. He was 27 years old. Intelligent and mature, he was a perfect fit to train and fly these mechanical monsters of death. Arriving in Vietnam in August 1967 he was attached to the 1st Cavalry Division in Binh Dinh Province, a large enemy-infested area. Dayton was part of the elite 229th Assault Helicopter Command and flew daily in support of a variety of major offensives. Known affectionately as “Tar Baby” by his fellow pilots, he was well-respected and experienced. In April 1968, the Marine Corps had suffered large casualties at Khe Sanh. The 1st Cav was on the move again to relieve some of the combat troops. Because of his experience, They needed a pilot to ‘scout’ the valley, locate enemy formations, and mark them for assault attacks. On May 9, 1968, CWO Lanier and his door-gunner, Cpl Chris Frankhauser (OH-13) was called into action to find out where the NVA mortar encampments were. They needed a pilot to ‘scout’ the valley, locate enemy formations, and mark them for assault attacks. Artillery blanketed the area. C/229th was inserting troops and spitting machine gun and rocket fire support. Dayton and his gunner were in constant danger this day. Swooping low they would try to find where the enemy was…..and would lob a white phosphorous grenade towards the ground to mark the location. The Flight leader and another pilot were headed back to Dayton’s area for another run. On the same FM frequency, they heard him communicating with the ground troops that he was getting ready to make another marking drop. Racing to give him support, they heard a report on the radio that OH-13 had just exploded and crashed….and that some of the ground troops were heading to the site. The Flight leader quickly switched to his Company frequency and quietly said “Flight, that was Tar Baby”. It was a solemn moment for all, even in the heat of battle. Flying over the area, they couldn’t see his helicopter due to the heavy forest canopy…..but his last airburst of white phosphorous marking is vivid in their minds still today. Upon a later investigation, it could not be determined whether CWO Laniers helicopter was shot down or had a mechanical failure…..as it burned quickly and thoroughly upon impact. Neither men survived the crash. Dayton had just turned 28 years old one week before. Dayton Lanier’s name is inscribed on the Vietnam Memorial Wall at Panel 57E, Line 26. 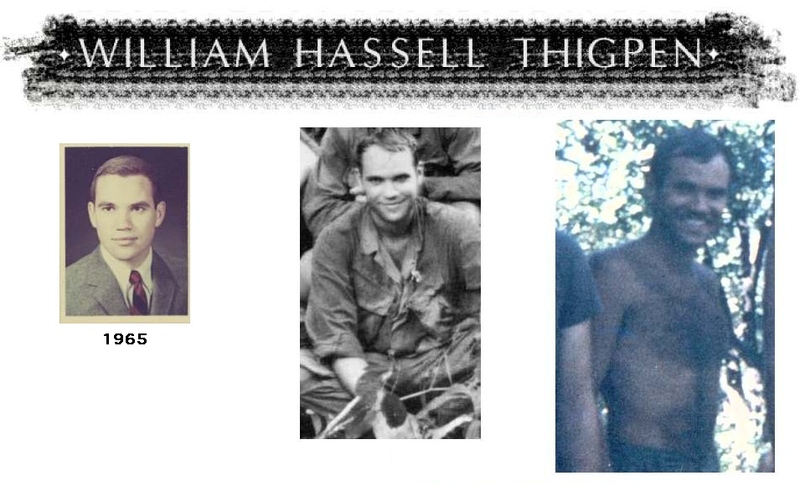 Bill Thigpen was the 1st Platoon Leader, B Company, 1st Battalion, 5th Cavalry, 1st Cavalry Division. He was shot in the chest by an enemy rifleman inside a VC bunker complex near FSB Apache. I am an eye-witness to the event, as I was speaking to him face-to-face when he was shot. Bill was a great soldier and a fine man. His loss is still painful to me even after all these years. He left a wife and daughter, both of whom have prospered in life. He is buried in his home town of Tarboro. author unknown.